On Jan. 23 — in daylight and clear weather — a 17-year-old driver attempted to cross the Taconic State Parkway via Hibernia Road in the Town of Clinton, one of 24 intersections in Dutchess County where traffic crosses the highway without benefit of an overpass or underpass. Police aren’t sure if the young driver failed to see the oncoming car or misjudged its distance after stopping at the highway median. In that momentary lapse, his passenger, a girl one week shy of her 16th birthday, became the eighth person to die at a Taconic at-grade crossing in Dutchess in the last five years; the driver became one of 30 injured at that intersection alone. And Hibernia Road isn’t the worst of the many treacherous crossings as the Taconic winds through 38 miles of Dutchess County terrain. In a study of intersection accidents on the four-lane parkway from January 1994 to March 1999, the Poughkeepsie Journal counted more than 300 crashes and almost as many injuries. Seven of the 10 worst intersections are crossed routinely by school buses full of children. At Carpenter Road in East Fishkill, the deadliest Taconic crossing in terms of injuries, 72 people were hurt in 48 crashes, including a 1994 accident that claimed two lives. A second fatal accident occurred in 1997 just north of the crossing after a woman turned from the median into oncoming traffic. Arthursburg Road in LaGrange was a close second with 54 injuries and 36 crashes, and Hibernia was third with 25 crashes. In most crashes, police cited drivers for failing to yield the right of way on the meandering roadway, where intersections are often around studcurves, atop hills or between rocky outcroppings and wooded hillsides. 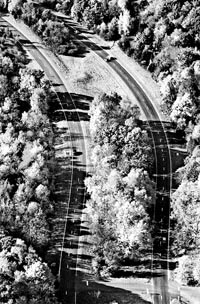 This section of the Taconic Parkway, located in Dutchess County, was photographed in October 1999 from about 800 feet above the ground. Although the parkway offers motorists a scenic view of the Hudson Valley, the Department of Transportation is studying several sections to address concerns about safety. The state has long known of the problem: Its studies show that accidents occur at the three deadliest crossings at six times the rate of similar intersections statewide. Yet, three decades after a state report recommended ridding the parkway of its dangerous crossings, the crash toll — driven by increased traffic and greater speed — continues to mount. "We hear an accident at an at-grade crossing on the Taconic and we are anticipating a fatality,’’ said Edward Murray, president of Northern Dutchess Paramedics, which responds to parkway crashes. "They are just so often horrific." Murray cited Nine Partners Road in Clinton as a difficult crossing; it ranked fourth on the Journal’s list and had two fatal accidents in the last five years. Both crashes involved elderly drivers who failed to yield to parkway traffic. The drivers died when they were hit broadside. "The at-grade crossings are our biggest liability on that parkway," acknowledged Robert A. Dennison III, regional director of the state Department of Transportation, which oversees state roads in the seven-county region. "We are thinking about them and addressing them." Indeed, the state’s effort to do so goes back 30 years. In 1970, a report commissioned by DOT found that half of nearly 200 intersection crashes in the 1960s were caused by failure to yield the right-of-way. It recommended eliminating all of the 22 crossings that were studied: Two interchanges and eight overpasses would be built; 10 would be closed, with options for the others undecided. Since then, interchanges were built in the 1980s at Bulls Head Road in Stanford and Beekman Road in East Fishkill, and an overpass was opened recently at Miller Hill Road in East Fishkill. But long after the idea was first broached of closing the parkway to cross traffic, progress at the remaining intersections is agonizing slow — stymied, state officials acknowledge, by the often conflicting issues of safety, convenience and cost. "The reason it drags on so long,’’ said Richard Peters, regional planning manager, "is there is no easy solution." Indeed, opposition invariably greets proposals to close off access to the highway — by homeowners who use the parkway, farmers who farm both sides, businesses that rely on it. When the DOT proposed closing Hollow Road in Clinton in 1997, the Dutchess County Legislature and two local Grange outposts passed resolutions against it. Three town supervisors expressed variations on that sentiment with regard to crossings in their towns. At Miller Hill Road, the problem was resolved only after two 1996 accidents involving school buses — luckily without children aboard. They led to a petition drive that garnered 4,000 signatures from the community. The overpass cost $14 million; eliminating all the crossings was estimated in 1970 to cost $18 million. When the bus accidents occurred, the DOT already had renewed its study of the intersections. From December 1994 through March 1999, traffic engineers produced 13 accident studies of 10 intersections. They recommended closing intersections at Todd Hill, Skidmore, Mountain and McDonnell roads in LaGrange, and at Stormville Road in East Fishkill; constructing an overpass at Carpenter Road; and, "at a minimum," closing the center median at Arthursburg Road. The DOT reports were read by the Journal, which was later refused copies under a statute of law that precludes release of federally financed accident studies. Officials said they should not have given the Journal access to the reports in the first place; the Journal has appealed the decision. While accident rates at almost all the intersections were above normal, the Skidmore Road report was unequivocal: "The intersection must be closed off completely,’’ a document in the study reads. "Any (DOT’s emphasis) accident at this site related to turning or crossing movement is an accident that should not have happened because this at-grade crossing is simply and, absolutely, not necessary." Those words were written in a July 1995 internal DOT memorandum. At least 11 accidents have occurred at the intersection since then, and work to close it won’t be done until 2001. Like other crossings, Skidmore is near alternative roads that offer access to the parkway, chiefly the Route 55 interchange only a half-mile or so south. But that doesn’t stop the argument. "There are much more dangerous ones they should close first,’’ said Dr. Beth Davies, a Skidmore Road resident who uses the parkway to go to work in Newburgh. "Skidmore Road is a well-used road and the visibility (at the parkway intersection) is excellent." Closure opponents such as Davies often argue that driver error and speed are the main causes of intersection crashes — not necessarily the crossings themselves. Both speed and driver error are problems. The average ticketed speed on the parkway rose from 71 mph in 1991 to 73 mph in 1996, according to a Journal study. And police and state reports both point to faulty judgment as a cause of many crashes. ‘‘The issue in northern Dutchess is weighing the need for ease of access to less populated areas against the level of safety,’’ said Marc Molinaro, a county legislator from Tivoli who worries that other options besides closing intersections haven’t been considered. Community objections have deterred DOT, at least temporarily, from closing McDonnell and Mountain roads, which are within several hundred yards of each other. Mountain Road was the site of a fatal accident in 1987 when a state trooper’s car hit a vehicle emerging from the side road, killing a 41-year-old woman. The crossing is typical of some of the highway’s problems. On the northbound side, where that fatal crash occurred, the crossroad meets the parkway at the top of a hill, offering limited sight distance for emerging drivers. And drivers turning off the parkway must come to a virtual stop amid fast-moving traffic in order to navigate the narrow opening. At other points, drivers on such roads as Carpenter and Arthursburg have little warning that they are approaching a major highway. And turning traffic often backs up in passing lanes because of narrow medians or heavy traffic. When the Dutchess portion of the Taconic opened in 1938 — as far north as Route 55 — its road-level crossings with their green wooden street signs were part of the parkway’s country charm. But since then, the Taconic’s function has changed from scenic byway to commuter artery, where traffic volumes have nearly doubled at some points since 1991. As a result, it is a far deadlier highway now than 10 or 20 years ago. From 1982 until 1989, there were 13 fatal accidents on the parkway in Dutchess County; from 1990 until 1997, there were 28, according to the federal government’s database of fatal accidents. Only three of those fatal crashes in 1980s were classified "intersection related;" in the 1990s, six were. Marshall Roberts of Poughkeepsie lost his wife, Loretta, 56, in one of them. Loretta Roberts and Florence Pinnock, 61, died when their car failed to yield at a stop sign at the Carpenter Road intersection with the parkway and was hit by an ambulance. "There definitely has to be something done there,’’ Roberts said. "It has to be a dangerous road with the growth and the traffic." "Safety has to outweigh the convenience," agreed Joyce Pinnock, Florence Pinnock’s daughter. The accident occurred in 1994, but little has changed at Carpenter Road, the most dangerous intersection on the Journal’s list. Street lights and flashing signals — red at the stop signs, yellow on the parkway — are to be installed soon. But plans for an overpass, first suggested in 1970, are still under consideration. State officials said it would cost around $3 million. "The at-grade crossings are dangerous," agreed Sgt. Robert Hogan, traffic supervisor for Troop K of the New York State Police. "We have to find a way around them." The state police, he said, are on record as supporting the closure of Carpenter, Hosner Mountain, Skidmore, Arthursburg, Hollow and Hibernia. Regarding Hibernia, he said, "You’re talking a couple of minutes of inconvenience for people to save lives. To me, that’s a no-brainer." At the Arthursburg Road intersection, he said: "You are just asking for a catastrophe’’ at evening rush hour when northbound cars stack up in the passing lane, waiting to turn left. And the Hosner Mountain crossing in East Fishkill, fifth on the Journal’s list, is treacherous for entering traffic: "You pray to God nobody’s coming." The debate over at-grade intersections pits people like Hogan and even some inside the state DOT against DOT decision-makers and town supervisors who view closing intersections as impractical. State officials note pointedly that they take their cues from the community, a far cry from decades past when they say the state simply did what highway work it deemed necessary with little local consultation. "We now engage the public,’’ said Dennison, the regional director. "They’re paying the bill." Cindy Reiman/Poughkeepsie Journal Construction along the Taconic Parkway at the intersection with Miller Hill Road on May 11. An overpass was built to carry the Parkway over the road in an attempt to improve safety. It was the department’s safety group that produced the most recent studies recommending that five crossings be closed, including the memo that emphatically urged closing off the Skidmore Road access. In response to that, Dennison said, "Our internal communication sometimes surfaces extreme positions that are unimplementable,’’ — or at least in the timeframe indicated, he added. William FitzPatrick, regional traffic engineer, acknowledged that, as an advocate for safety first, he sometimes locks horns with others in the department. "The department has become much more proactive and compassionate with the needs and desires of the community," he said. "I sometimes have a conceptual conflict with the rest of the department." Dellavern Bovell, 41, calls the intersection "dangerous.’’ The Brooklyn resident was a passenger in a car on the Taconic in July 1998 going north in the passing lane at Arthursburg Road. Suddenly, another car attempted to turn left in front of them. Six people were hurt in the crash, which left Bovell and her husband, Edson, with lasting back pain. "The suffering is long,’’ she said. "It’s not like you’re 100 percent like before." LaGrange Supervisor George Wade III agrees: ‘‘The real bad one is Arthursburg. It catches an awful lot of traffic.’’ He believes turning lanes off the parkway would prevent accident-provoking backups but said the issue hasn’t been raised by DOT. The question is whether such intersections can be fixed. Larger stop signs were installed at the Arthursburg intersection after a 1994 accident study found that some drivers didn’t see them. That hardly solved the problem, however. And some question work planned for the Hibernia Road crossing, where the median, perhaps one car-length wide, will be widened to accommodate more turning and crossing vehicles. "You’re still going to have accidents,’’ said Sgt. Hogan of the state police. ‘‘You’re still going to have the same amount of accidents. You’re still going to have the same severity of accidents." State Sen. Stephen Saland, R-Poughkeepsie, whose district is traversed by the Taconic, said he plans to meet soon with DOT officials to discuss, among other issues, the at-grade crossings. ‘‘There has to be a balance fashioned that first and foremost recognizes safety and also the needs of local people,’’ he said. As an issue, ‘‘it certainly has to be higher’’ on the DOT priority list, Saland added. Chelsea Morrison, the Millbrook School girl who died at the Hibernia Road intersection, would have been 16 on Feb. 1. "One death,’’ he said, ‘‘is too many."